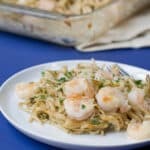 This Shrimp Scampi Bake is really quick and easy twist on the classic. 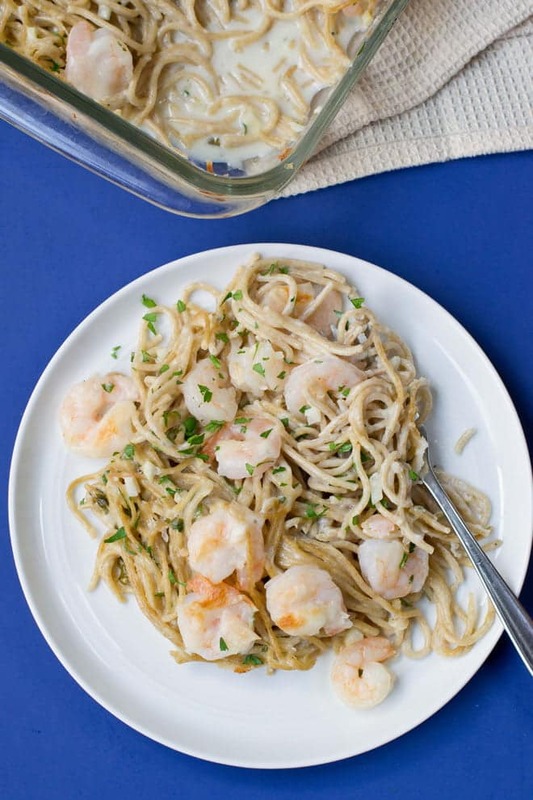 You cook the noodles then toss them with a cream-cheese and garlic sauce and shrimp. Bake until it’s all heated through. So good. So easy. Shrimp scampi. Mmmmmm. Shrimp and butter with garlic and lemon. 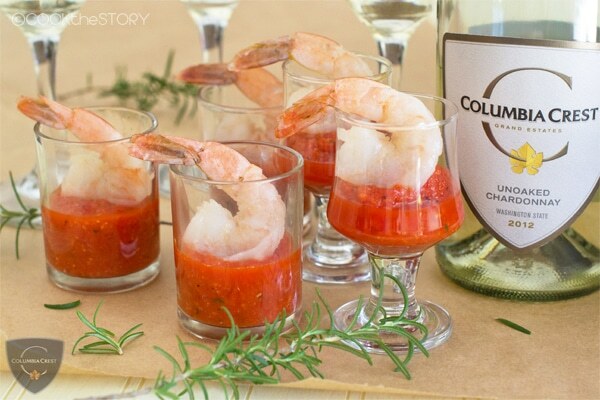 Add a splash of white wine for good measure (and pour yourself a glass to sip while you cook). How could that possibly be bad? No way. But, I think I’ve made it better. I’ve turned it into a pasta bake. It’s noodles and shrimp mixed with butter and cream cheese and mozzarella and garlic. Lots of garlic. Mix it all up and bake until the shrimp are cooked through and the cheese is melted. 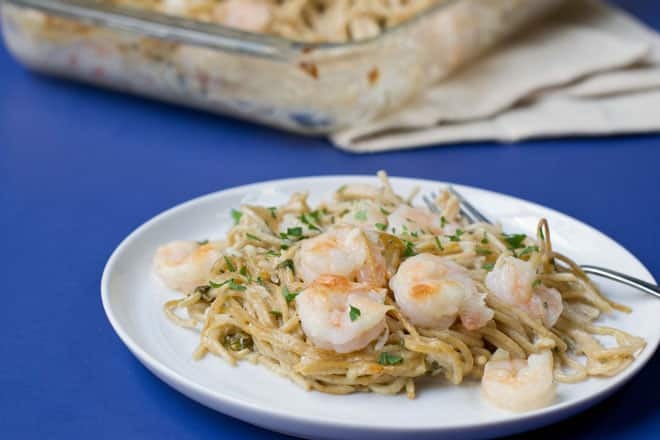 Get yourself a hearty slice of bread and maybe a green salad, a side of Roasted Asparagus, and you’ve got the tastiest Shrimp Scampi dinner ever. 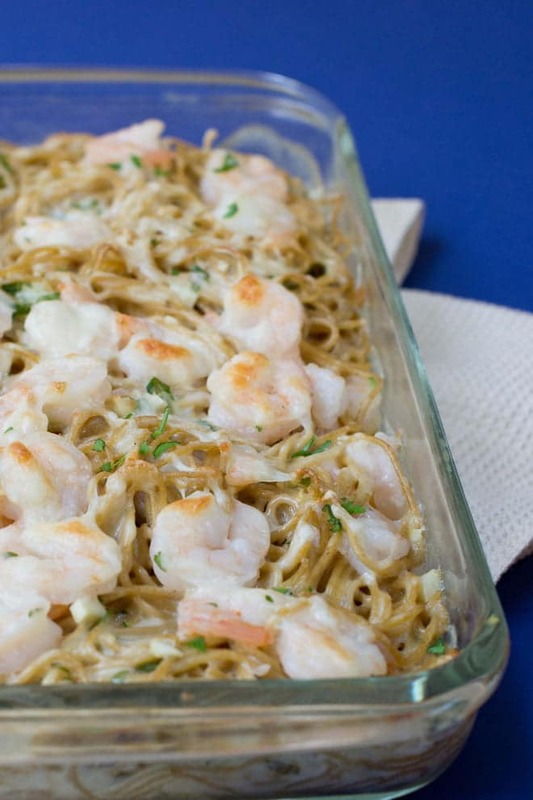 Here’s the recipe for Shrimp Scampi Pasta Bake. Cook the spaghetti according to package directions but scoop out 1/2 cup of the cooking liquid just before you drain it the pasta. Meanwhile, put the cream cheese and butter in a medium-sized microwave-safe bowl. Microwave on high for 30 seconds. Stir. Repeat until butter is melted. 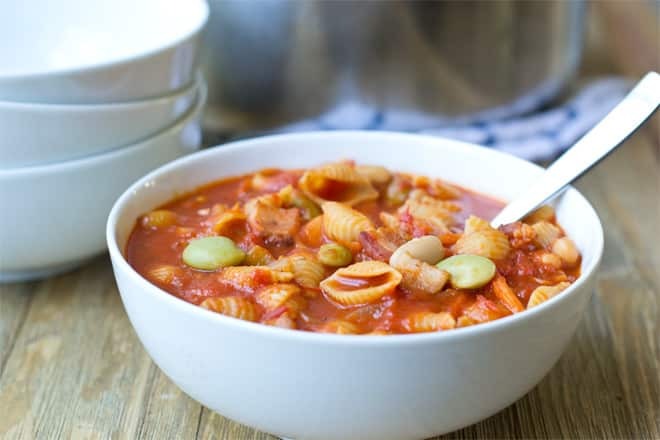 Use a whisk to really stir it up and get it incorporated together. 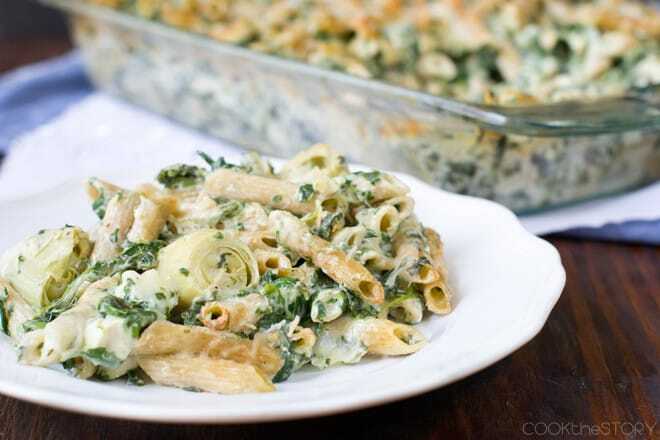 Stir in the 1/2 cup of reserved pasta water, the parsley, garlic, lemon zest, salt and pepper. Transfer the drained pasta to a 9x13" cake pan or casserole. Add the cream cheese sauce and stir to combine. Add the raw shrimp and 1/2 cup of the mozzarella. Stir again. Top with the remaining 1/2 cup of cheese. Bake until shrimp are cooked through (you can tell because they've all turned really pink and curled up) and the cheese on top is starting to brown, about 30 minutes. This post was originally published in September of 2015 and revised August 2016. I had to omit the parsley due to a food allergy in my household. But it still turned out wonderfully. Something I will for sure make again since it doesn’t take up too much time to make. 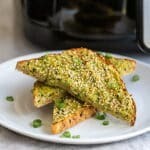 Patricia, It is such a quick and easy recipe. Glad you liked it! Made this last night. Had a little difficulty blending the sauce, don’t think it was warm enough. Added lightly steamed broccoli and tomatoes, turned out pretty good and hubby was s huge fan. Natalya, Yes, the sauce is tough to get mixed together but it does get there after a couple of minutes of stirring. Your variation with the added veggies sounds delicious. Glad you guys enjoyed it! 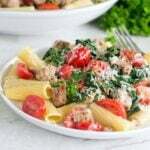 What a hearty and delicious sounding pasta dish! 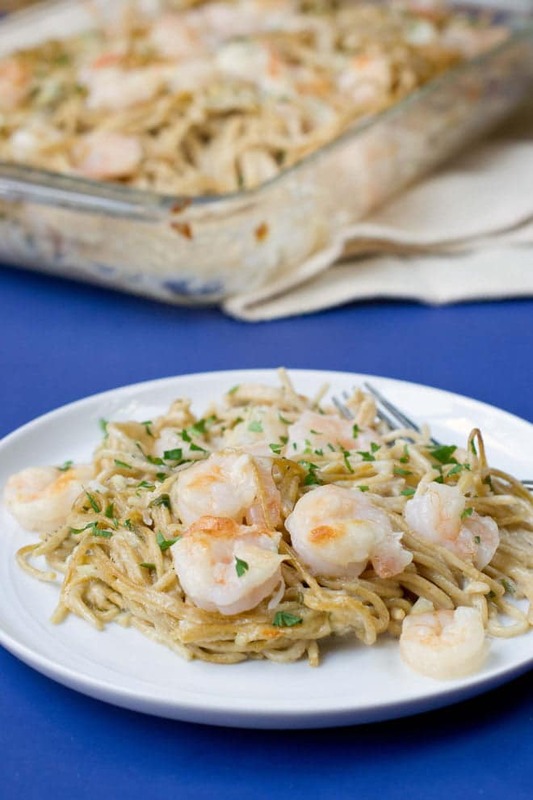 I love all the flavors and of course who doesn’t love pasta and shrimp….yum! 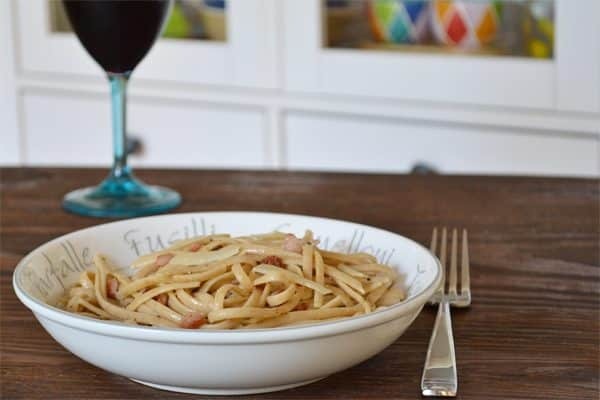 What a fabulous dinner for busy weeknights! I love how easy this is! 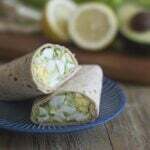 I am definitely trying this…I know my family will love this recipe! This quick and easy shrimp dish is perfect for a weeknight dinner. I normally saute shrimp, but I like the idea of baking them.